All transactions are safe and secure with a reliable history in online purchasing behind each of our associates. 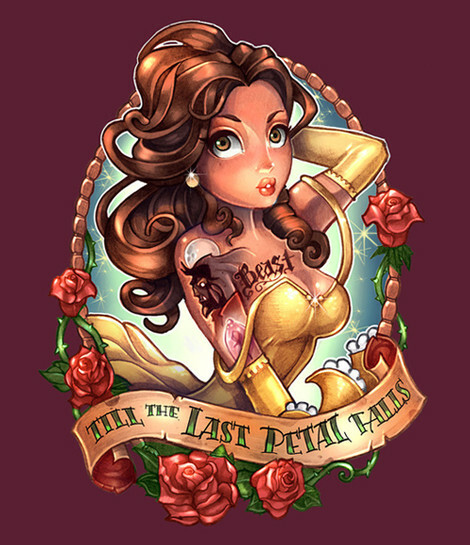 Buy the Belle Tattoo T-Shirt to own Beauty and the Beast clothing and merchandise. Belle is not afraid to let others know she's a nerd who buries her head in books all day, but at the same time, she's not afraid to let her beauty shine and express her love for the Beast either. Artistically, this is one of the best Beauty and the Beast Belle shirts for adults. The design features the village bookworm with a tattoo of the Beast across her shoulder and chest. Underneath her is the phrase, "Till the last petal falls." In addition to the Belle Tattoo T-Shirt above, browse the Beauty and the Beast Clothing Gallery for more apparel like men's and women's clothes, kids shirts or hoodies.